Spring is one of the best Framework’s around in J2EE field which has made integration to various Framework pretty easy. This article is in series of articles which teach about spring integration in details. All source code is checked into svn which can be checked out and tested. Assumption : Readers has basic knowledge of Servlets and JSP technologies. 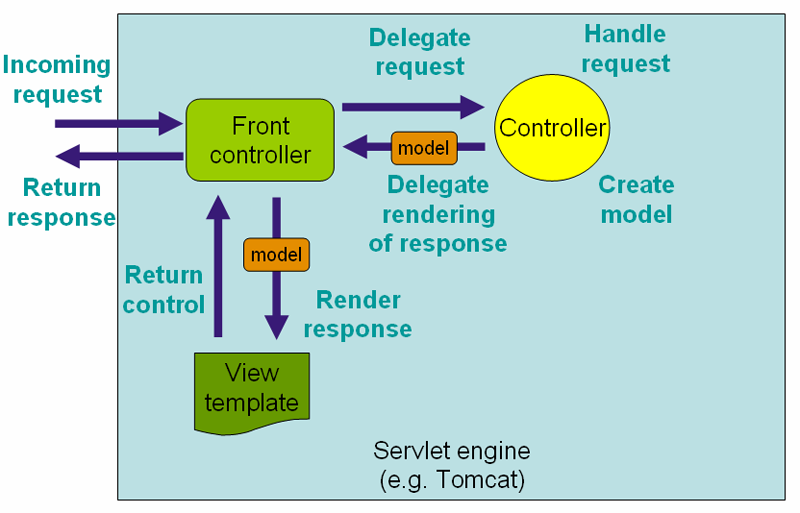 Any framework that has to integrated into J2EE frontend technology has to get control from Servlet Container, As all “http”(There can be other requests RMI/JMS..etc) requests are passed on to servlet container first which inturn based on configuration passes to corresponding framework. All the integrations are generally handle using servlet mapping, or using listeners or filters in Webapplication. Now that you have configured spring now start configuring spring beans in Spring configuration files. ( As per the above configuration file. All requests with url pattern services/* will get routed to spring dispatcher servlet. Which inturn takes care of request mapping based on Configuration files or using Annotations. so the configuration file that is read by default will be dispatcher-servlet.xml and then other files with same name pattern defined in context-param will get loaded. Above configuration also lists out url pattern’s that have to be excluded in this flow (Example all css/js/images etc files ). * Copyright 2011 the original author or authors. Now that i have given basic Introduction to Spring MVC integration i’ll take you through JPA Configuration both in Tomcat as well as JBOSS. JPA can be used in 2 ways ( Using Spring and Using EJB3 container) . As we don’t have EJB container in tomcat we use spring to configure JPA for us. And now that we have configured spring we can create entities in JPA style and use EntityManager to fire our queries. "UserName :" + users.get(i).getFirstName() + " "
I think i have covered all concepts and code snippets to get you started. Njoy playing with code. Get back to me if you have any questions.